Did everyone witness the insanely beautiful weather we had last weekend? No it wasn't in your imagination, it really did happen. Blink and you'd have missed it as we all woke up on Monday morning to our regular grey skies, like the weekend's sun was just a wonderful dream. Ironically, last weekend I was shooting in Lyme Park for this very post you're reading and the style concept I was going for was around Fat Face's perfect new Spring/Summer collection and how British summertime is all about layering... On the one weekend layering was no necessary. 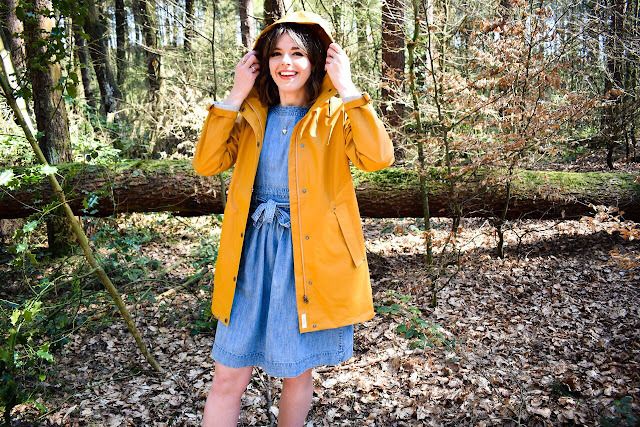 But last weekend's weather is sadly behind us and therefore my post on how to dress for English summer is yet again relevant so that's at least one positive I can take from our unwelcome dreary weather returning... That and I got to wear some pretty lovely clothes. 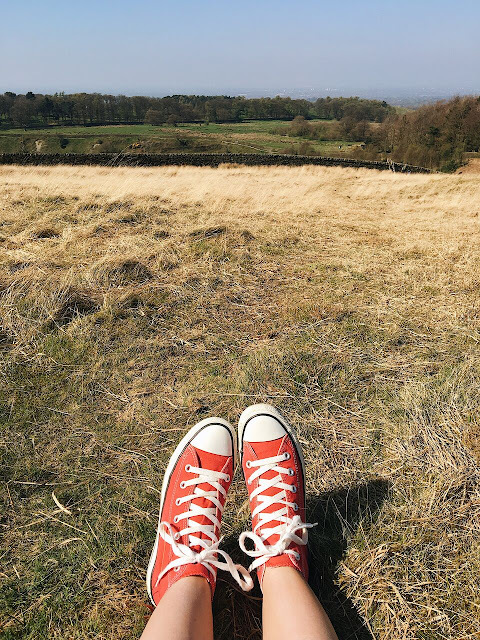 I decided to shoot for this post around Lyme Park because it amazes me that this beautiful location is literally a 5 minute drive from my house and yet I would never think to use it as a back drop for my blog photography... Until now. I guess you can't get more quintessentially British than the grounds of a manor house (featured in the Nineties adaptation series of Pride and Prejudice, FYI) in the middle of the Peak District and so it seemed like a no brainer to use it as a perfect example of how and why we should dress "English weather" proof over summer (despite it being 18 degrees when I shoot the photos, moving on...). The trick to styling English summer lies within two small and slightly obvious details; layering and denims. It sounds like such a Mum thing to say, "are you wearing layers because it will get chilly later" but as per usual Mums are always right. My ideal outfit for a Birtish festival is always denim dungarees. Stoned wash denim is undoubtedly made for summer, but dungarees will allow you to layer up with a T-shirt/sweater underneath and a jumper on top too if needs be. 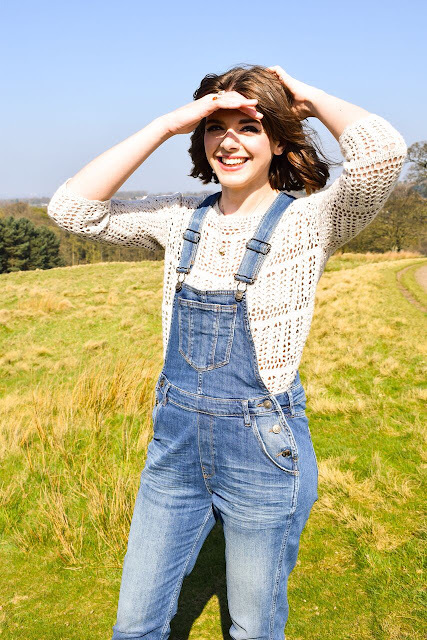 I've teamed my dungarees in this post with a gorgeous woollen crochet sweater... Again if there was ever a type of woollen made for summer is was the crochet kind and it's actually warm! You win on both accounts of looking super, summer ready whilst actually being comfortable and cosy. There is nothing worse than being stood in a field with a soggy paper cup full of flat cider, pretending to enjoy a band but secretly praying they would hurry up because it's absolutely freezing, you're pretty sure you've acquired frost bite and you might have to come to terms with loosing a toe... Maybe even a limb... Who knows, you're so cold right now that you can't think straight. It's horrible. Layering will forever save the day. 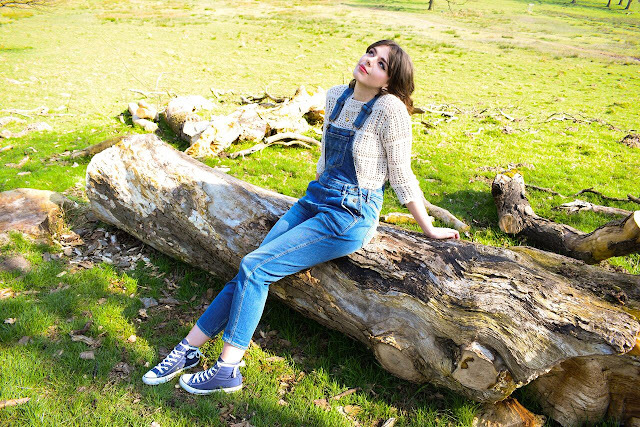 If denim dungarees don't float your boat; A) we probably can't be friends anymore BUT B) There is another denim/layer alternative which I love equally as much and is maybe just a touch more summery than their denim relative. 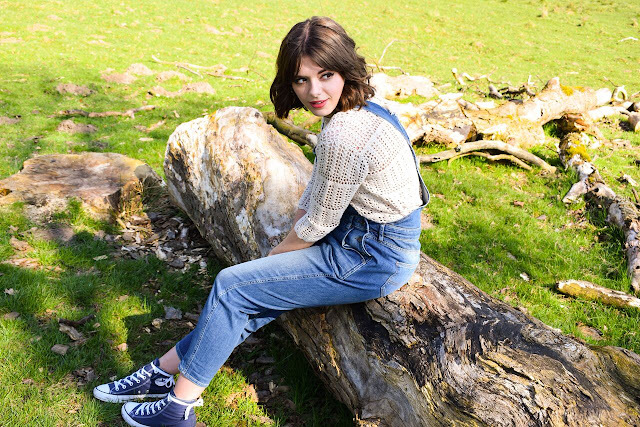 The denim pinafore. It's my personal belief this is a wardrobe necessity to be worn all year round. Weather you're planning on teaming it with a classic breton top, a vintage blouse or a real favourite of mine at the moment, floral jersey, a denim pinafore will give the outfit a sweet, girly twist. They're comfy and they never go out of style. I love the one photographed in this post from Fat Face with the tie front detailing and pockets (every girl loves a dress with pockets right?). The tie front and pockets give the dress a seventies, vintage, almost "grown up" feel to it, that I'm a big fan of. Complete the outfit of with my signature Converse vibes and this outfit has a perfect amount of both girly and boyish charm to it, which will see you through English summers for the next 10 years (please don't hold me to that). Stone wash denim will forever be the cheat's way to dress for British summer and I have no problem with being that cheat. Lastly, no English summer or festival for that matter would be complete without a reliable raincoat layered over the top of any and (sadly) every outfit. I love the idea of primary coloured macs. There's something really old fashioned, endearing and kind of kitsch about it. Like you're an extra from Singing In The Rain. That's why I opted for this vibrant mustard yellow design from Fat Face, surprisingly it goes with everything and I feel like if you have to wear a raincoat (again, I'm from Manchester so YES you most definitely have to), you might as well embrace it in the most fun, loud and proud way possible. 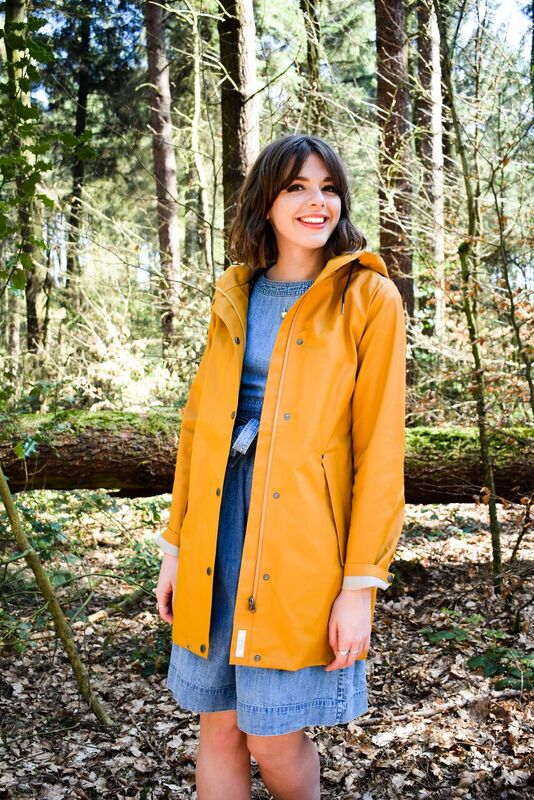 If your days not filled with sunshine, at least your coat can be. Besides this should be the number one item of everyones festival survival kit list. It's practically compulsory. Yes, Britain definitely has the raw end of the deal when it comes to summertime weather but as long as you learn to accept it (yes, that means resigning to the fact not every single one of your prettiest summer dresses is going to get a look in this year), embrace it and learn to dress for it than there is absolutely no reason you should have feel the need to miss out. Layer up, ladies, layer and lets make the most of our summer. If You're Leaving Will You Take Me With You?